Elvis Presley memorabilia adorns this no-frills joint serving up burgers, onion rings & fries. Full disclosure: The new owners are like family to me. Known them a long time. Long enough to know that I HAD to finally eat at Mr. BURGER even though I never stepped in this almost 40yr Oshawa mainstay the 12 yrs I lived in Whitby/Oshawa. Saying that, I've never had a Steak sandwich as good as the one I had at Mr. Burger. They carve the meat from the sirloin proper! I mean really?? So good, and the bun was perfect. Admittedly, I didn't enjoy the onion rings but man are they famous! And huge. 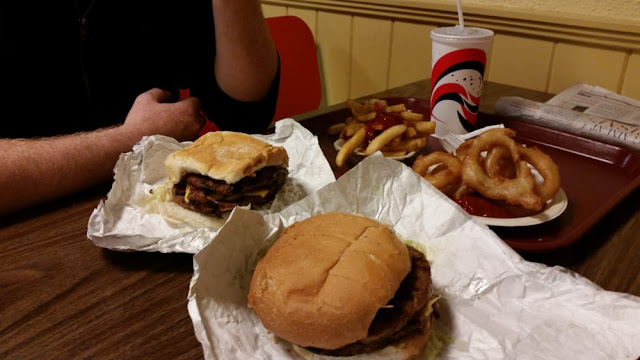 If you're driving through Durham on your way to points East, you'll get a much better feed stopping at Mr. BURGER vs any of the On Route rest stops. I am from Montreal originally and return home often. I know each and every over-priced generic rest stop. Oh, and they have JUST introduced a homeburger...6oz never frozen. Again, yes I know the guys but ALSO know this burger grind well. Go for it (if they haven't sold out). 0 Response to "Mr Burger"